HDPE Plastic Pallets are often made of new HDPE. Including storage series, pilling series, storage moisture series, is the important tool in modern transportation, warehousing, packaging. They are usually extremely durable, lasting for a hundred trips or more, and resist weathering, rot, chemical and corrosion, in line with national environmental requirements. 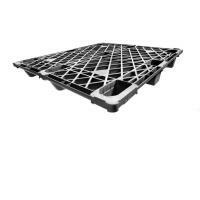 The benefits of plastic pallets include the ability to be easily sanitized, resistance to odor, fire retardancy, longer service life span, durability and better product protection, non-splintering, and lighter weight, thus saving on transportation and labor costs and making them safer and more environmentally friendly. Is widely used in warehousing logistics of food, pharmaceutical, tobacco, chemicals, machinery, electronics, ports and other industry. 1.We are not only a trading comany, but also a professional manufacturer for many years. 3.Our professional designers are always pursuing to developing new and unique products with their innovative spirits, so OEM & ODM are welcome. 4.We have been specialized in plastic products for many years and got a lot of reputation and long-term business partners..
5.Our products are tested by authorities, and we promise the quality.